Website and processes: 20 Apr 16 TS, 4/5 Good "Straight forward process for ordering vouchers"
Always wanted to experience the power and refined road handling of a true supercar? Then this is just for you. Drive 3 miles in a Lamborghini Gallardo. Friends and family are welcome to spectate. Valid weekdays only. This experience will last a total of approx. 1 hour with approx. 1 hour in the vehicle. Experience a Lamborghini - drive one of these most exclusive of Italian supercars for four thrilling laps. 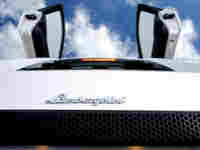 With a price tag of over 130,000 UKP, the outrageously fast Lamborghini is normally reserved for Premiership footballers. Now you can slip into the leather seat, engage the first of six gears and start to work the Italian 500 bhp V10 engine that sings as sweetly as any opera diva. With an expert instructor by your side you will be able to enjoy unrivalled performance and handling. Please allow 1 hour at the venue. Note: Event at Dunsfold will be on the Southern Circuit. It is possible to upgrade to the main circuit on the day for 20 pounds. Each voucher entitles one person	to participate in this experience. The voucher is non-transferable, which means that only the person named on the voucher can use it. The voucher remains valid for bookings for 12 months from the date of purchase. Please contact the operator	using the details printed on your voucher to arrange a date for your event. The voucher will have Long Marston Circuit printed on it, but it can be used from..